- Design and manufacturing of functional, ICT, JTAG test solutions (hardware and software). A-E Electronics Bacau is a private owned company, founded in 1998 by S.C. Aerostar S.A. (Romania) and Elbit Systems Ltd. (Israel). At present, the company is entirely owned by Elbit Systems Ltd. Growing up together with its personnel, A-E Electronics aquired proven capabilities of manufacturing “high mix low volume” electronic subassemblies and integrated products, cables and harnesses for the aerospace and defense industries. In the same time, A-E Electronics developed unique capabilities for designing and manufacturing of automated test solutions, making use of the specific up-to-date tehnologies. The logistic capabilities of the company ensure that all the activities are aimed to deliver maximum value for its customers, at the lowest prices. 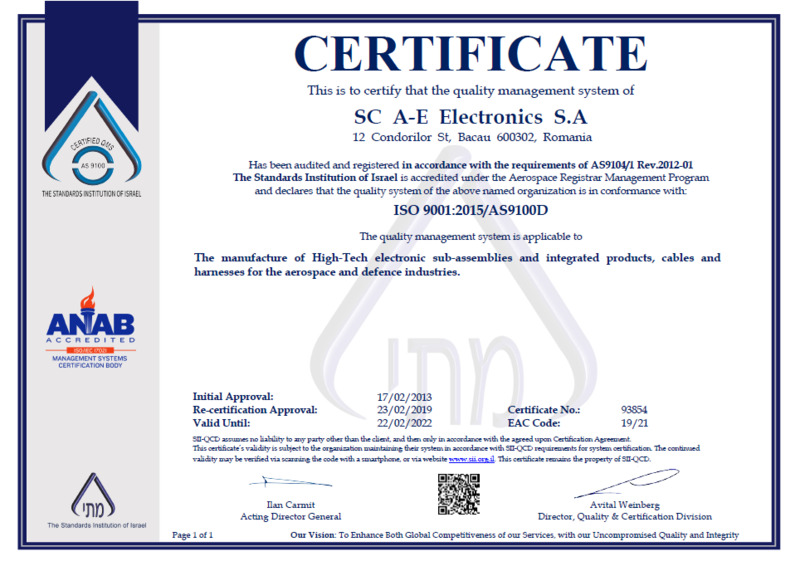 Since the beginning of its activities, the quality management system has been certified as conforming to the ISO9001 standard and at present, it is certified as conforming to the more demanding AS9100 requirements. In all our activities we are deeply committed to highest business ethics principles (Code of Business Conduct and Ethics, Anti-bribery compliance procedure and Supplier Code of Conduct). A-E Electronics is located near the european E85 route and near the Bacau International Airport, benefiting from an easy acces to transportation means – terrestrial, railway or by air (see the MAP). Telecommunications provide telephony, fax links, e-mail and data transfer, without restrictions of volume. tel: +40 234 585 800; fax: +40 234 585 900; e-mail: office@aee.ro.